NASA's GALEX observatory spotted dwarf galaxies (in circles) growing inside the Leo Ring of interstellar gas, a region that is invisible to optical telescope but visible to GALEX's ultraviolet-scanning instruments. Thisstory was updated at 1:43 p.m. EST. A stellarnursery tucked away in a distant cloud of interstellar gas has givenastronomers a glimpse of a new way that galaxies can form. Hints ofthe star birth were spotted in an ancient gas cloud known as theLeo Ring, which appears to lack the vital heavy elements and darkmatter that astronomers normally expect to see in growing galaxies. The LeoRing find suggests that some galaxies may not need those core ingredients togrow. 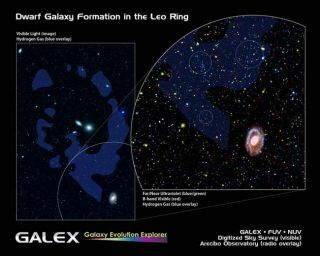 Astronomers used observations from NASA?s ultraviolet GalaxyEvolution Explorer (GALEX) spacecraft to make the discovery. ?Thisdemonstrates the tremendous power of observing the ultraviolet from space,? saidstudy co-author Mark Seibert, an astronomer with the Carnegie Observatories. ?By discovering star formation in what is likely a new class of dwarf galaxythe Galaxy Evolution Explorer observatory is certainly living up to its name.? Discoveredin 1983, the Leo Ring is a vast cloud of hydrogen and helium locked in orbitaround two distant galaxies in the constellation Leo. Since the cloud is nearlyinvisible to optical telescopes, it was first spotted by radio astronomers andsubsequent attempts to plumb its depths for star formation have come up empty. NASA?sGALEX observatory, however, is equipped with sensitive detectors that scan thesky in the ultraviolet range. The spacecraft spotted clouds of star-formingregions within the Leo Ring that astronomers believe to be dwarf galaxies. Sinceprevious measurements of masses and speeds of objects within the Leo Ringsuggest it lacks any significant sourceof dark matter, researchers are unsure how the dwarf galaxies have managedto form. Dark matteris a mysterious substance thought to make up 85 percent of the entire supply ofmatter in the universe and serve as the foundation atop which galaxies mature. Thestuff is invisible, with astronomers inferring its existence from itsgravitational influence that aids galaxy formation. Researcherssaid that it is possible that the gas inside the Leo Ring could be theuntouched leftovers from the beginning of the universe. If so, its dwarfgalaxies could be built from nearly pure hydrogen and helium, and represent howgalaxies formed during the early universe when heavier elements wereunavailable. Theresearch will appear in the Feb. 19 issue of the journal Nature.Astronomer David Thilker of Johns Hopkins University led the study, withSeibert and fellow Carnegie Observatories astronomer Barry Madore serving asco-investigators and co-authors. "Thenext phase is to follow up these objects with deep imaging and spectroscopyfrom the ground,? said Madore, who is also a co-investigator with NASA?s GALEXmission. ?An observing run on Carnegie's 6.5m Baade telescope is alreadyscheduled for this spring."